Mee hoon kueh or ban mian are dishes rarely experimented on. 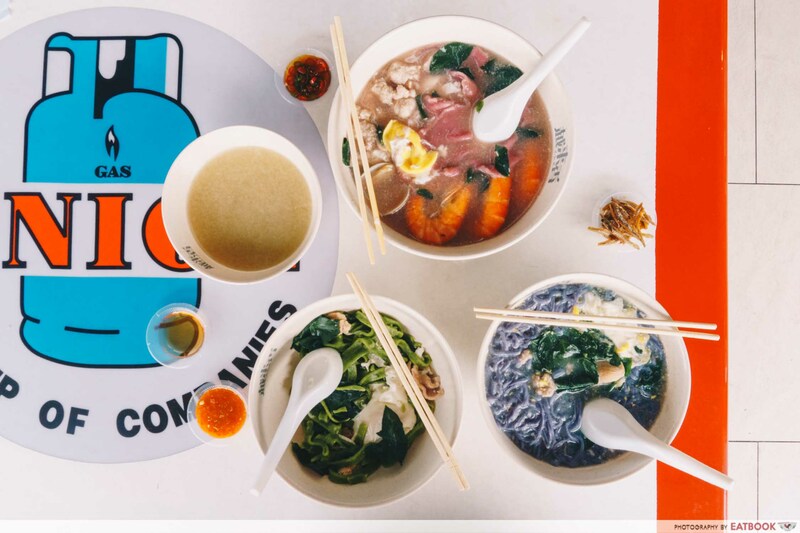 Chefs might have played with the idea of tweaking the broth and altering the sides, but few have contemplated changing the noodles, as the brains behind Yue Lai Xiang Delights have done. 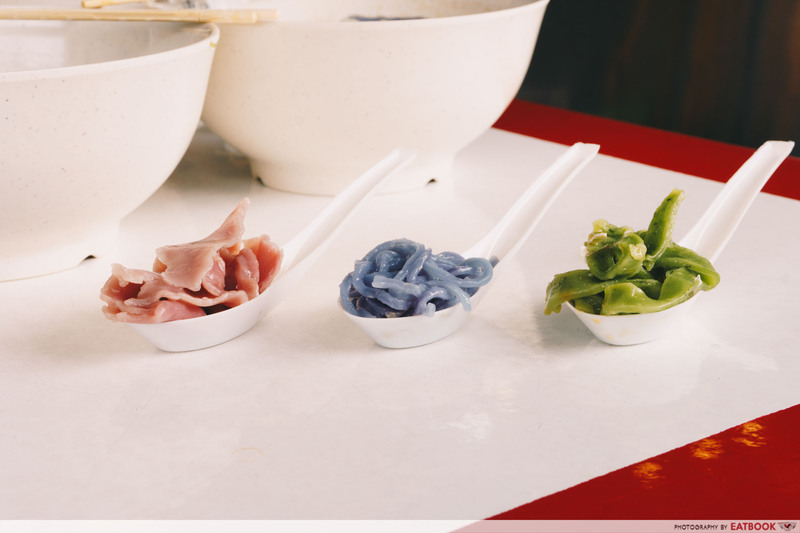 Offering a myriad of coloured noodles made from wholesome ingredients such as beetroot and butterfly pea, these noodle dishes are the perfect backdrop for a #foodporn post. 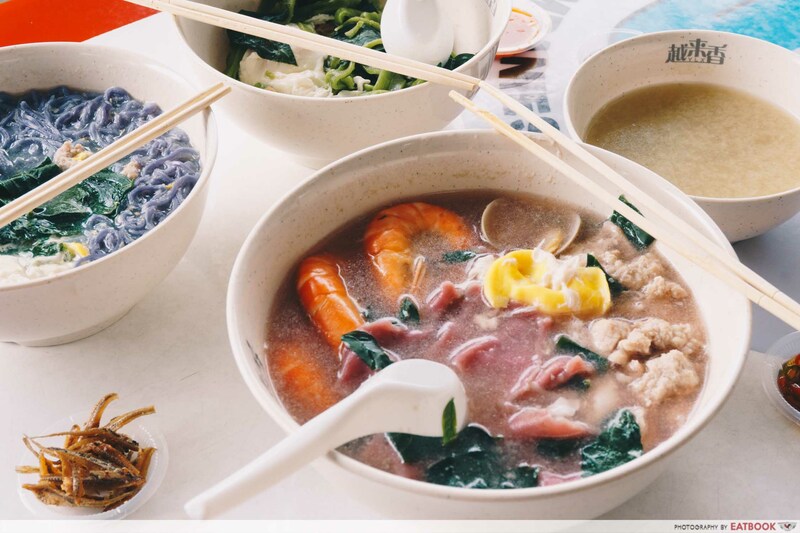 Being authentic and serving house-made food are two guiding principles the people behind Yue Lai Xiang Delights fervently abide by. Here’s a typical scene at the stall: blocks of colourful dough are first kneaded to shape, then passed through a machine, before being hand-pulled upon order. 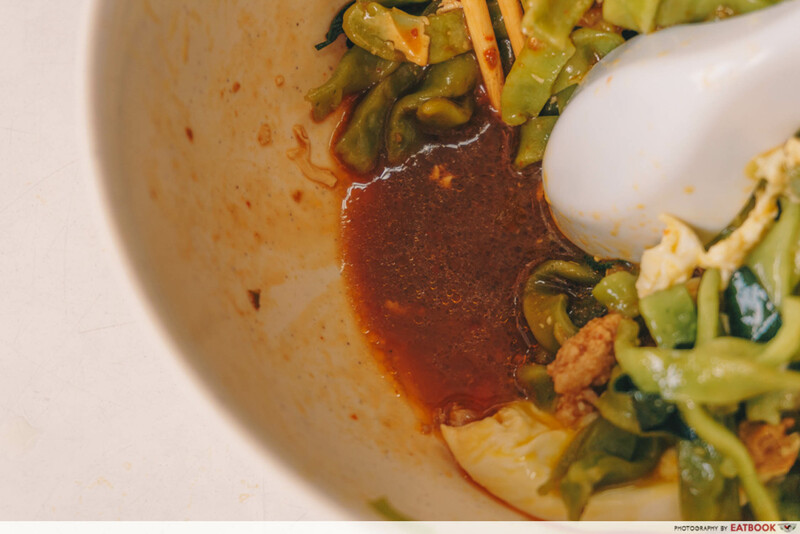 The broth – tell-tale sign of a good noodle dish – is MSG-free and simmered overnight with pork bones, dried sole fish, and sweet corn. Every spoonful of soup brimmed with umami and had a mellow sweetness. With its attractive azure blue strands, the Butterfly Pea You Mian ($4.50) instantly grabbed our attention. 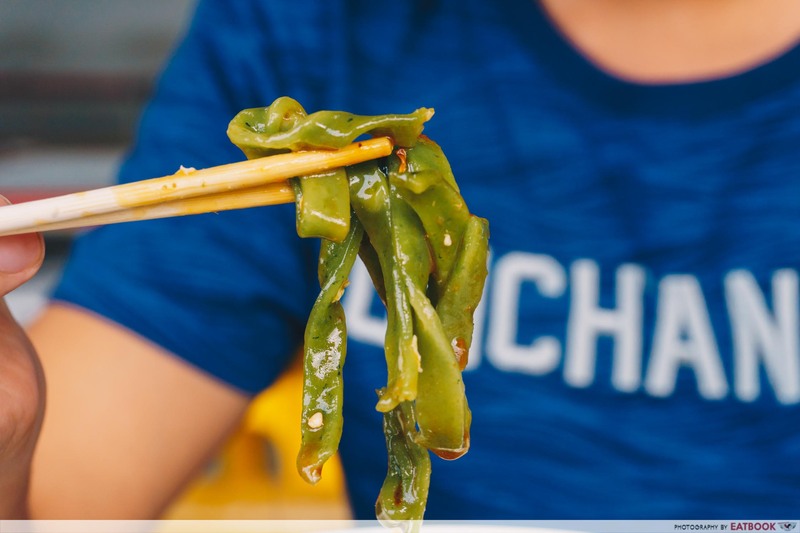 The dish was peppered with blanched mani cai, a vegetable that I embarrassingly mistook as spinach at first, which enhanced the broth’s sweetness and laced it with subtly herbaceous undertones. 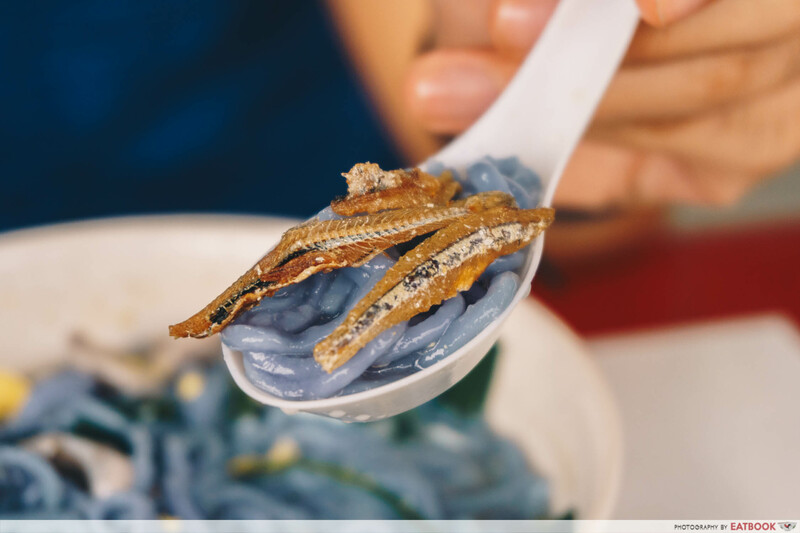 Cooked al dente, the butterfly pea noodles had a glossy sheen to it and were perfect for voracious slurping. 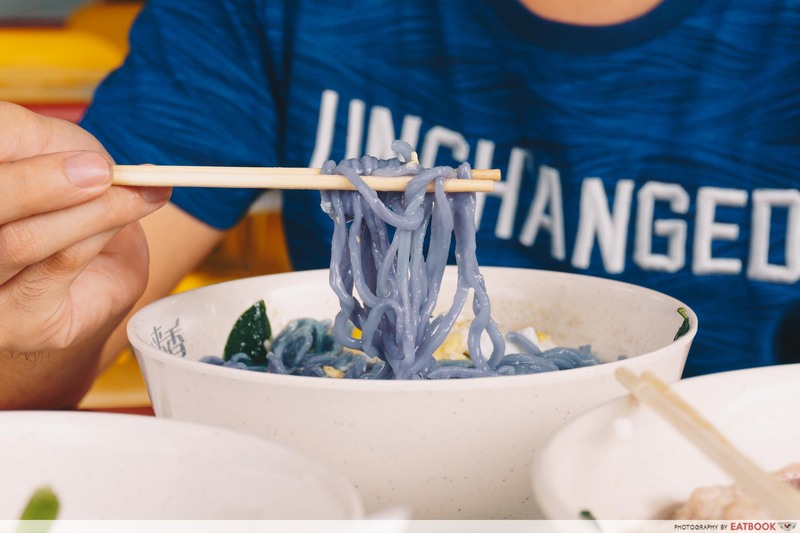 Flavour-wise, the noodles carried the faintest hints of butterfly pea which only the most sensitive of taste buds could detect. The natural blue dye is only added for aesthetic purposes, as it adds no change in flavour. The thick pork slices offered a substantial bite without initiating a vigorous jaw tussle. 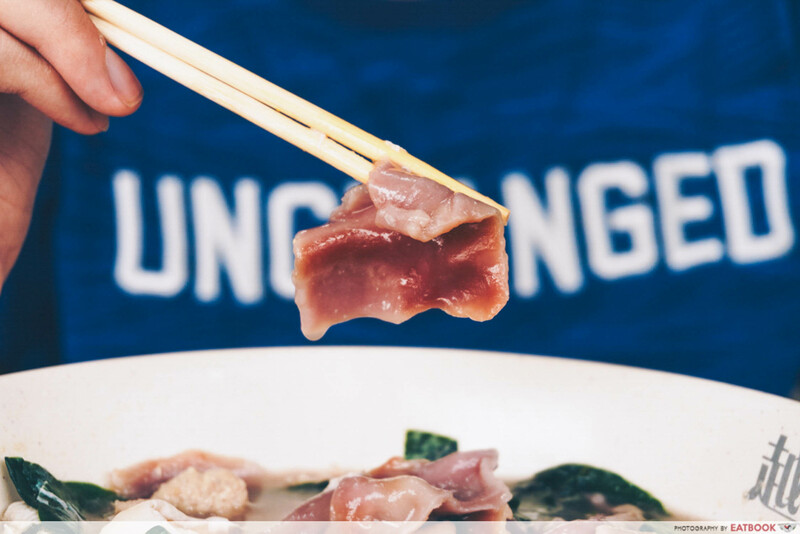 As you comfortably tore the lightly marinated meat, every bite unfurled in its natural porkiness. Seasoned with salt and pepper like the pork slices, the irregularly-shaped ball of minced meat and fat held well together and offered added texture to each mouthful. 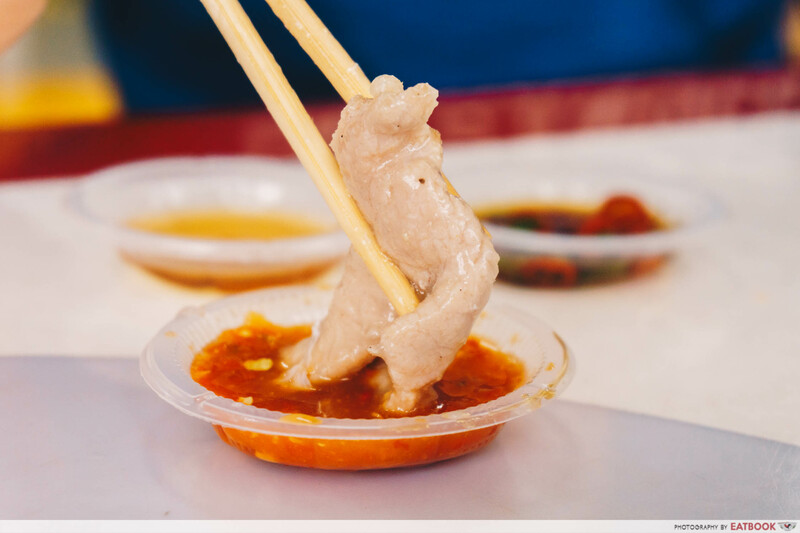 The meat’s light seasoning made an ideal partner for Yue Lai Xiang’s house-made chilli sauce. Mixed with lime juice and vinegar, I enjoyed how the tangy relish added refreshing notes to the meat. What I appreciate most about Yue Lai Xiang Delights is their attention to details – right down to the ikan bilis. Larger than those used in other ban mian stalls, the ikan bilis here has a gentler saltiness and a sweet aftertaste. This allows customers to shower these toppings without overpowering the dish. 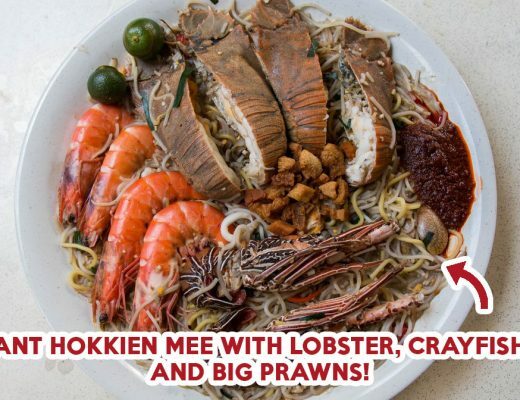 We decided to upgrade the Beetroot Mee Hoon Kueh ($4.50) by opting for the Premium Seafood ($8) broth version instead. The standard broth was bolstered by the added nuance of crustacean sweetness from the prawns and littleneck clams, giving it a more full-bodied flavour. 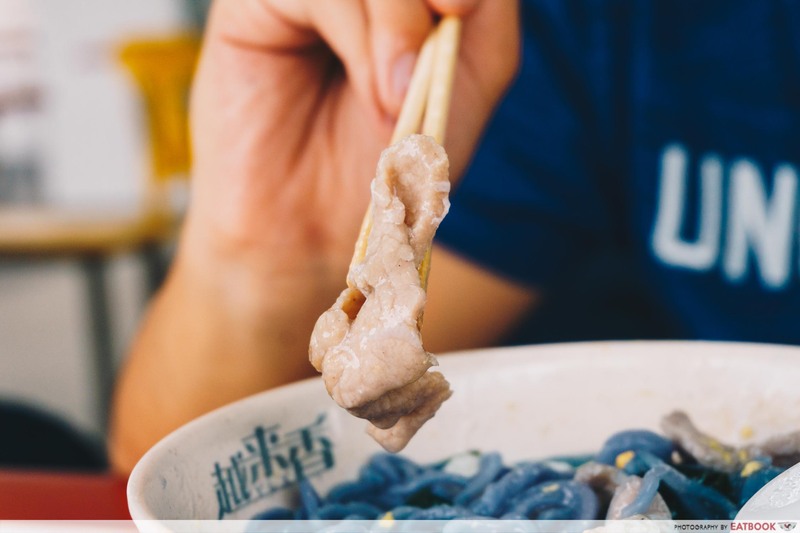 Hand-torn upon order, the mee hoon kueh teased with a playful jiggle. Impressively, the dough retained a springy texture despite resting in the broth for a long time. Unlike the blue butterfly pea version, this pinkish mee hoon kueh was infused with a rich earthiness from the beetroot juice. This is one dish beet enthusiasts would flock down for, whereas non-beet aficionados would shy away from. 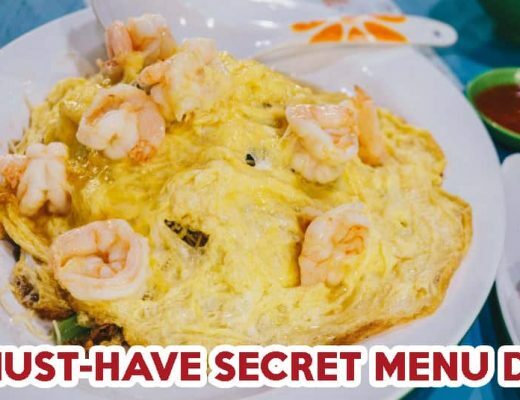 I experienced little hassle coaxing the prawn meat out of its shell. 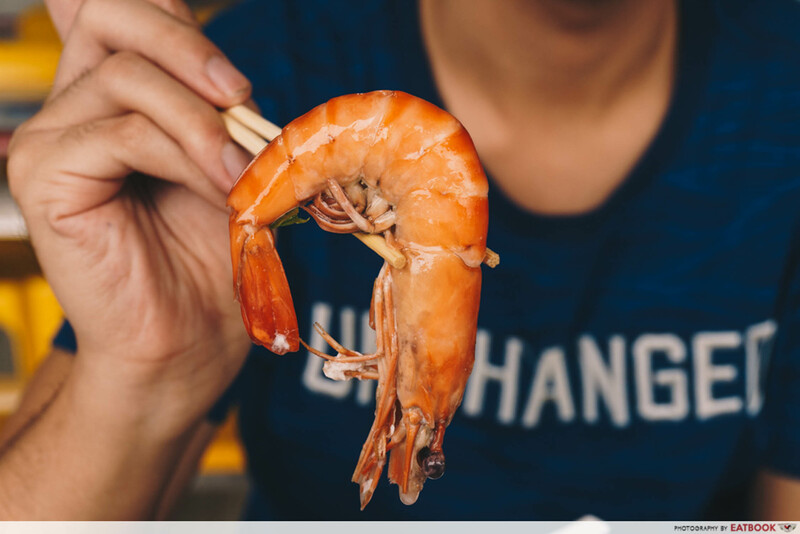 Juicy and firm, the prawn meat released a briny sweetness. The littleneck clams, however, were slightly overcooked and tasted disappointingly tough. To round off our meal, we had the Dry Spinach Ban Mian ($5.50). The dry version is served with mani cai, pork slices, meatballs, poached egg and a bowl of soup. Don’t forget to get yourself an extra helping of their house-made chilli sauce if you are a fan of spicy food. Owing to the fibrousness of spinach, the noodles were both springier and thicker. 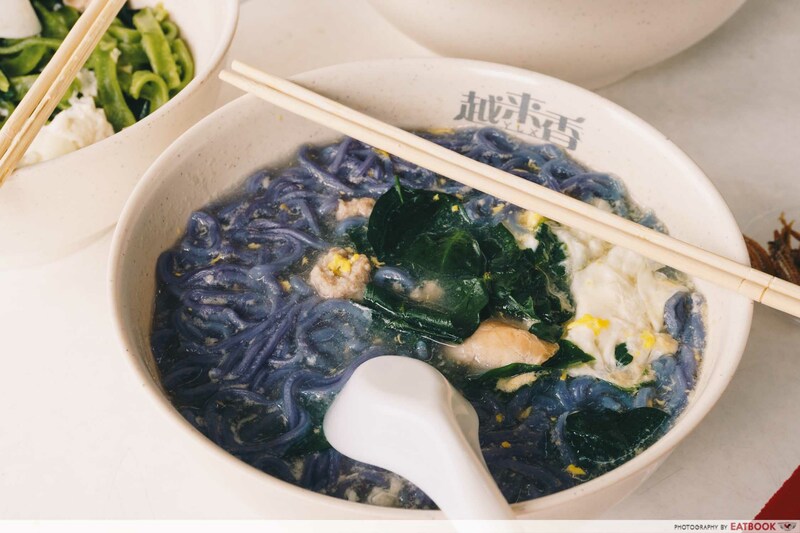 If, like me, you enjoy your noodles slightly undercooked to give it a light springiness, the spinach noodles are worth paying Yue Lai Xiang a visit for. The ban mian noodles were tossed in a robust blend of their house-made sambal chilli, soy sauce and pork lard. Fried with dried shrimps and ikan bilis, the sambal chilli greeted one’s mouth with bold hae bee savouriness before exploding in a burst of spiciness. 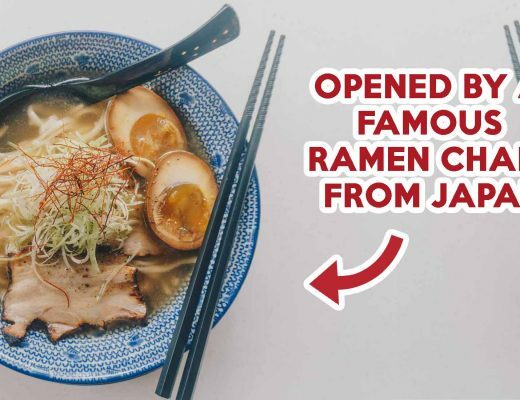 Paired with the saltiness of the soy sauce, the dry ban mian is suited to those with a preference for strong flavours. 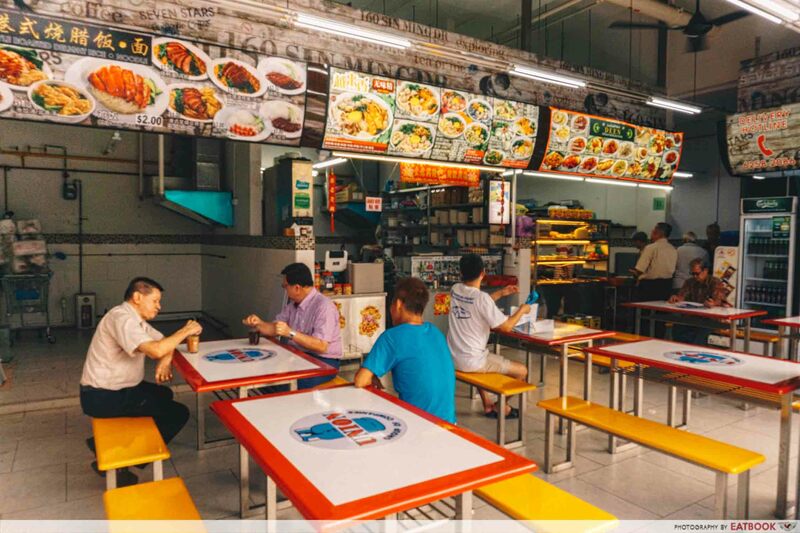 Tucked within a quiet industrial estate, Yue Lai Xiang Delights experiences little activity outside lunch hours. With its array of strategically positioned fans, the place is well-ventilated, which is a welcome relief from the sweltering hot weather. Take note, however, that the food court is small and has limited seats. I believe sincerity matters in cooking. Food inevitably tastes better when they are made with love and passion. 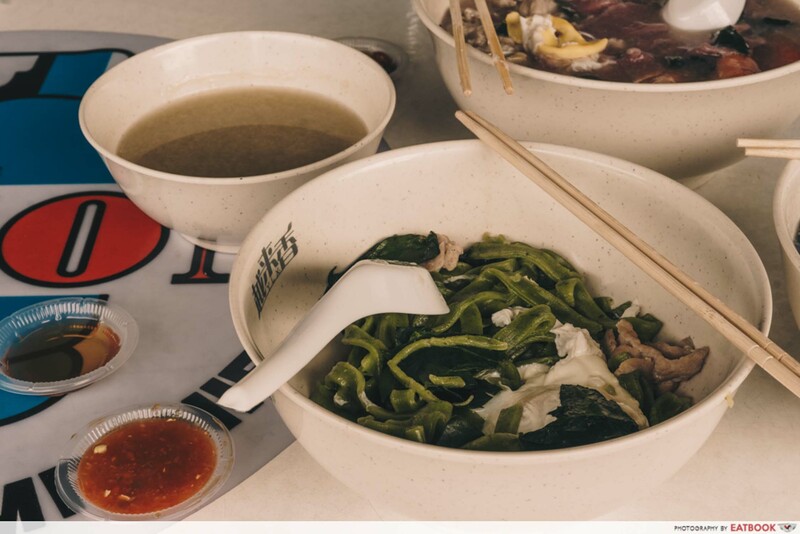 Knowing of the store-owner Joy’s efforts in creating a wholesome dining experience, every mouthful of noodles at Yue Lai Xiang Delights will bring a surge of warmth to your heart. 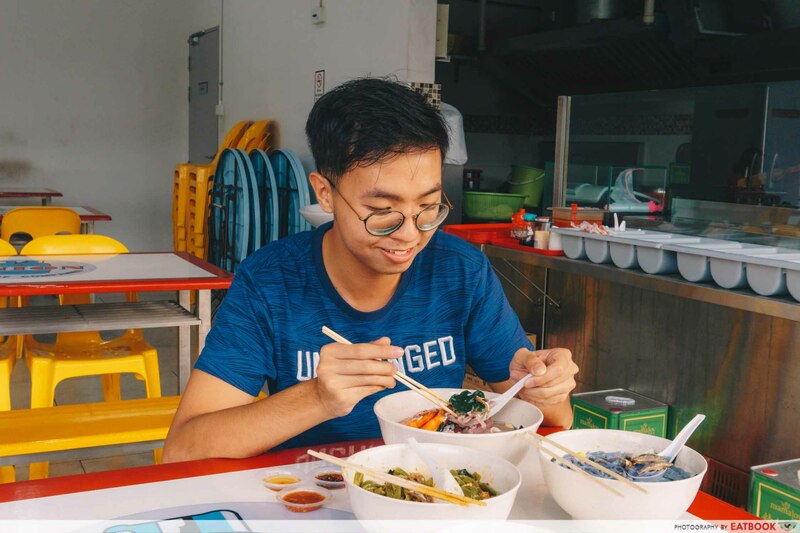 If you are a butterfly pea enthusiast, check out our review of Simple, a hidden gem tucked within Lavender offering one-of-a-kind butterfly pea flower nasi lemak! Yue Lai Xiang Delights is not a halal eatery. Photos taken by Gerald Koh.